My blog has only been around a couple of months, so it's too early to do a year-end round-up. Instead, on this first day of 2018, I'll forget the fact that I'm sitting in frigid Ohio (where it's currently -4°F/-20°C) and dream of a hot summer years ago when I was traveling in Bulgaria and Romania. Part of the fun of being a travel writer is learning a bit of each country's folkways. Romanians, for example, have a notion that if you're born in a cold month (like this one), you'll wind up loving cold weather the rest of your life. And if you're born on, typically, one of the hottest days of summer (as I was), you'll end up loving the heat the rest of eternity (apparently). This is a story of a birthday celebrated on the road one very hot year when I put that notion to the test. Top Photo: Somewhere in Bulgaria on the road researching a guidebook during a crazy hot summer a few years ago. Photo by the guy who rented me the bicycle. Posted in On The Road and tagged birthday, Bucharest, Bulgaria, Romania. Raluca and I enjoy a well-deserved early-morning dip in the pool. Photo by unknown. My birthday falls in July, on the 23rd. As anyone in Romania will tell you, if you were born sometime during the summer that means that you’ll love hot weather the rest of your life. I’m not sure where this quaint proverb comes from (we don’t have it in the United States), but I do know that in my case, it’s absolutely not true. While I hate extreme cold, I'm also no fan of extreme hot. For a travel writer, though, the summer months are when you make your dough. In a typical year, I’m out on the road from early May through September carrying out research for an article or a guidebook. That means I’m usually away from home on my birthday. Since I often write about Central and Southeastern Europe, that means I’m also usually somewhere where it’s way too hot to celebrate. On the road, of course, the forces of the universe often conspire to pull you out of your comfort zone. And so it was that on one year, at least, I discovered that summer "babies" (like me) could indeed learn to love the heat. My story takes place a few summers ago, when I spent the month of July in Bulgaria researching a guidebook for the American publisher Fodor’s. It was a good trip, but as the month wore on, the temps crept higher and higher. I made my way slowly north through the country and wound up in the Danube port of Ruse by my birthday. The temperature that day reached something like 45°C (113°F). I’m not what you’d call a birthday guy. Most years, I prefer not to even to acknowledge it. But it’s also no fun to spend the day alone. I didn’t know a soul in Ruse, but I did have friends in Bucharest, less than two hours by bus to the north. I sent a text to my friend Raluca in Bucharest and told her it was my birthday and asked if she might have time for a drink. It was stifling hot in Romania too, but she was up for it. Raluca knew some people who were renting private apartments, so she snagged a room for me for the night, and we made plans to gather for a beer. I hopped a bus over the river to the Romanian town of Giurgiu, and from there grabbed another bus that brought me to a small stop in front of the Hotel Horoscop near Bucharest’s Piața Unirii in the center of town. I stowed my stuff and headed over to Cișmigiu Park, where Raluca and a few of her friends had already started drinking. Some of the nightswimmers. Photo by Mark Baker. 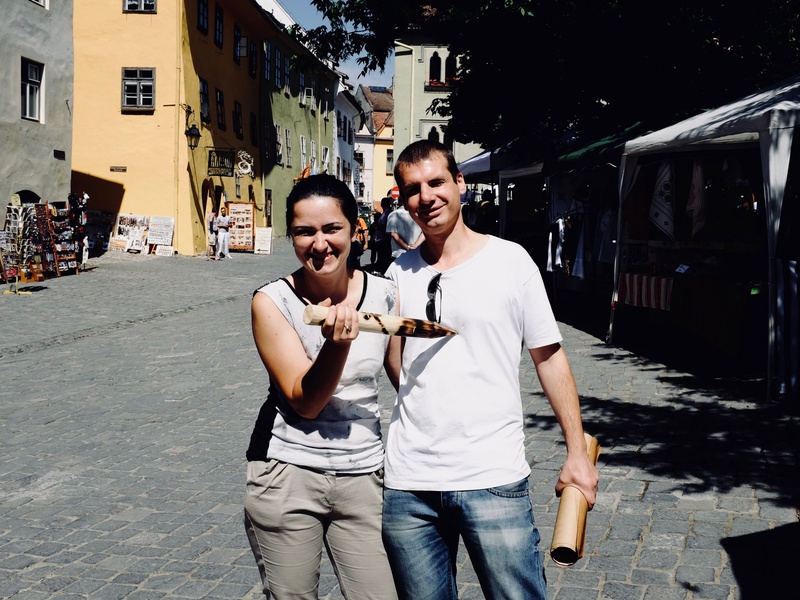 Raluca and her husband Mark, pictured here in the Transylvanian city of Sighisoara in more recent times. Photo by Mark Baker. It was around 10pm by the time I finally arrived. The sun had long set, but the temperatures had hardly budged. If anything, it was even hotter than 45°C that evening as we sat on a terrace beside the park’s tiny lake. I can’t remember much of a breeze. We raised a beer to my birthday and had a couple more before the staff booted us out after midnight. From there, we walked over to a club and sweltered in the basement as we tried to find enough energy to dance. Two hours later, we were back on the street. My birthday looked to be coming to a miserable, sweaty close. At that point, one of Raluca’s friends, it might have been her high school buddy Cristi, had a stroke of genius. He proposed getting some taxis and heading out to a public pool. We could break in, he said, climb the fence, and go for a little private swim. And so it was decided. Less than an hour later, about 3am or so, the 5-6 of us were silently squeezing our way through a small gap in the dark gate that led to a large pool out back. I never did find out the name of place; of course it had long been closed for the day. We were hot, tired and drunk, but that couldn’t stop the elation we felt as we stripped down to our underwear and dove in. The cool water cut through both the heat and malaise, and our shared complicity in trespassing bound us together like thieves. It turned out to be quite a memorable party. Just before sunrise, we snuck out of the pool area and found a couple of taxis to take us back to the center. I fell happily into my bed that morning around 6am, still in my wet clothes and stinking of chlorine. To be honest , I don’t even remember that night . But I am happy that someone is remembering it and even have o photo of my young years ! I am sure you don’t! My pleasure. Hope you enjoyed the story.